SAN FRANCISCO -- Since the day Oculus VR premiered on Kickstarter in 2012 the question has been: "How will users control these virtual reality video games?" That question was answered Thursday when the Facebook-owned company announced a new partnership with Microsoft to bundle Xbox One controllers alongside the Rift headset. The company made the announcement at an event where they finally gave detailed information on the first consumer version of the Rift, which is set to start shipping early next year. Phil Spencer, Microsoft's Head of Xbox, announced that Oculus gamers will be able to stream Xbox One games on their Rift headsets. After the show, Spencer spoke with the International Business Times and answered a few questions. International Business Times: What motivated you guys to do this partnership? Phil Spencer: For the real motivation, I go back to our origins with Windows when there were hardware companies doing real innovative work on top of our platform, and I think that's a good spot for us to be with Microsoft supporting these ecosystems. Some times we'll participate with products, like the Xbox, but in other opportunities it's best to find people who are doing amazing work and just say "What can we do to help you guys be more successful with your product?" And that's where we are with Oculus VR. I've known [Oculus VR CEO] Brendan Iribe for years, I've known the team, so it was natural because of the relationship. It was fun to come out and do this with them. IBTimes: How does the partnership work? Will you guys get a licensing fee for each Xbox One controller? Spencer: I won't go into the details, but it's nothing too complex. If you thought about how you might get a controller from us, it's kind of like that. On the other stuff, in terms of the technical integration, it's just working collaboratively on things that we're good at. There's not a financial thing there on the streaming. It's just we want them to be successful, we want Windows to be successful, and if people can play Xbox games in more places, we think that's good for everyone. 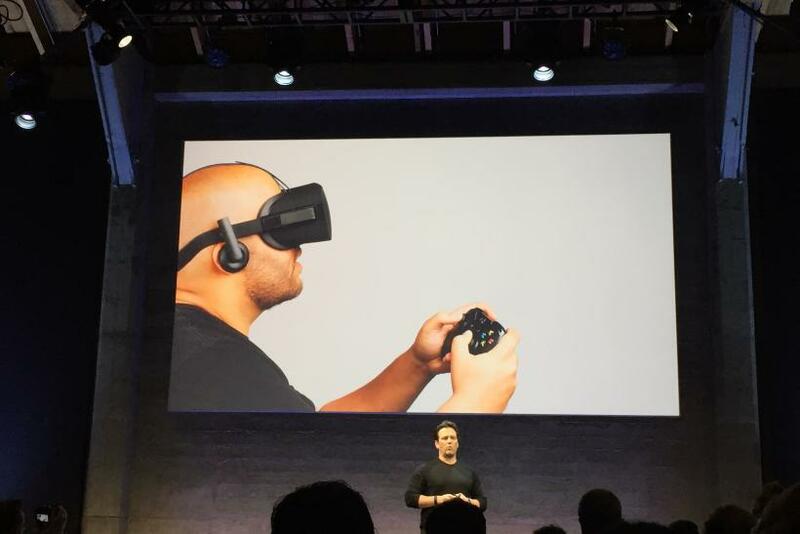 IBTimes: How will the Oculus Rift stream Xbox One games? Spencer: It's really nice. It's a 2-D display in a 3-D world, so we're not turning all the Xbox games into virtual reality games. But the fact that you get a big screen -- the screen kind of feels like that (Spencer points to a giant projection screen at the event thats about 7 feet by 10 feet) -- and the fact that everything else is nonexistent, everything else is blacked out, your mind's eye is on the screen, it's really a nice, immersive, dark experience. And a lot of the guys back at the office, that's the way they want to play. IBTimes: How will this partnership impact the Hololens, the augmented reality headset Microsoft announced earlier this year? Spencer: This partnership allows us to focus on a space that's different from them with our Hololens, which has a lot of things still to be figured out. This partnership seemed like the right for me. The whole Hololens team sent me a picture -- they actually watched the briefing with the Hololens on, streaming the picture on the wall. It's like the most surreal thing, but they were all really excited about the show.